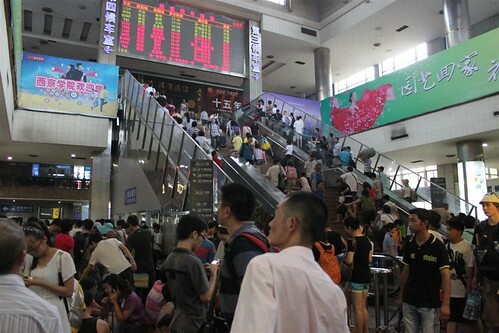 If you think that the public transportation in Beijing, China is overcrowded, wait till you board a train at Beijing Railway Station. 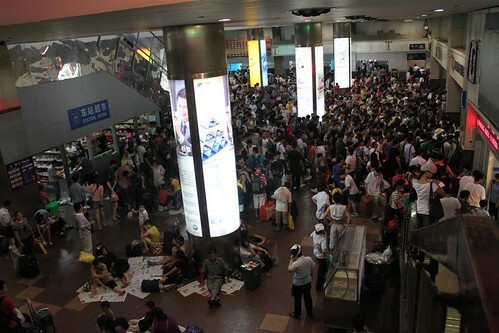 Railway stations are always overcrowded with people in China, no matter it's during the peak or non-peak season. 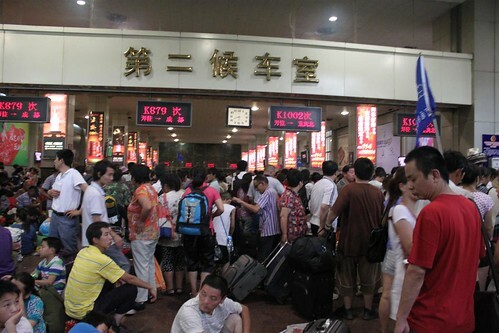 The locals in China prefer to travel by trains because they are cheaper than taking flights. 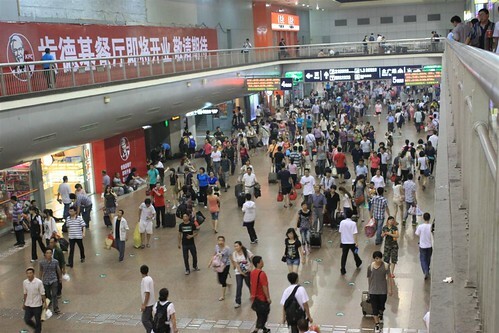 Besides that, the train services are more accessible to smaller towns and villages compared to the airports which are normally located in the cities of China. Although the ride in a train is longer than taking a flight, you will be definitely enjoy the nature and countryside scenery during the train journey. 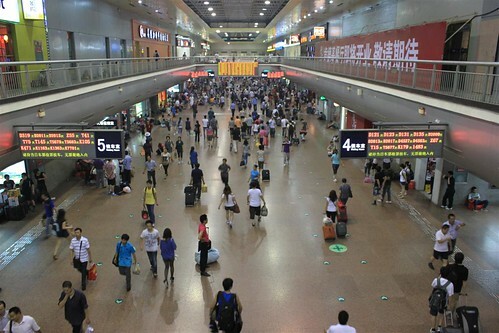 Traveling in China by a train is similar to taking a flight at the airport. 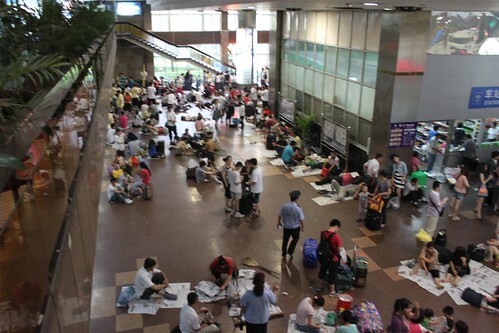 The railway stations are always crowded with people and all the luggage need to be scanned before entering the train stations. As such, you should arrive at the train station about an hour and a half (1 1/2 hours) early before your departure. It was our first time, traveling by trains from Beijing to Xi'an and vice versa for a trip to Terra-cotta Warrior. Since it was a day trip to Xi'an, we decided to engage a private tour who could arrange our transportation and tour trip from Beijing to Xi'an and back to Beijing. We preferred to have some privacy hence, we took a private room with double decker bed and a small private bathroom in a train during our journey. 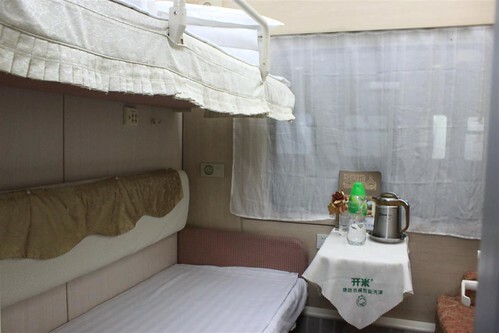 It's not cheap for the private room in a train, which costs us about US$250 for 2 people on a single trip. On top of that, refreshment isn't included in your train ticket hence, it's advisable to bring your own water bottle and some snacks (such as bread, noodle in a cup, 3-in-1 coffee packet, your cups and utensils) during the trip in case, you are hungry in the middle of the night. Moreover, cafeteria is not available in all train services so, bringing your own food and drink is very essential throughout your journey. For us, a single journey takes an overnight trip (about 11 hours). The locals in China eat noodles all the time. 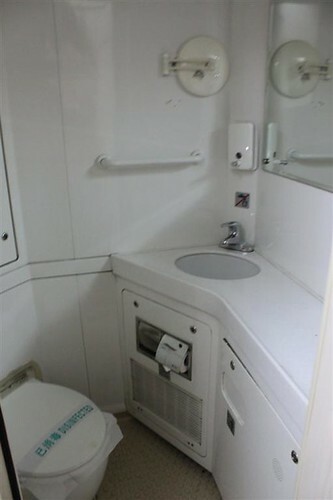 Thus, all the train services provide hot water dispensers for those who want to make their hot noodles in cups or to make hot drinks. As water storage is limited in the train services, bathing isn't allowed in the private and public washrooms. You are allowed to bring some small towels to freshen up yourself, brush your teeth and wash your face during the journey. Overcrowded with people who are waiting for their departure and some of them who just arrived. 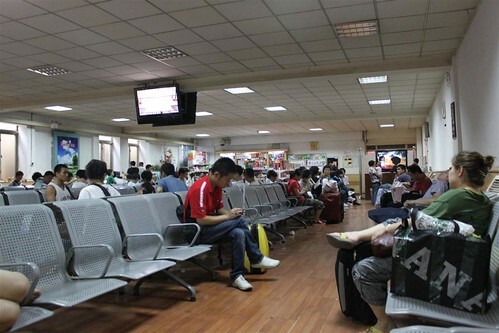 This is the departure waiting area. These passengers were waiting for their train no. to be announced before boarding. These passengers came too early and waited outside the departure area. These people came too early and had to wait outside the departure area. 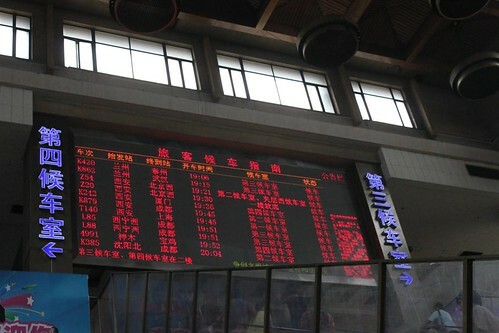 The departure and arrival board in the train station. It looks similar to the airport. Overcrowded with people who came very early and waited outside the departure area. 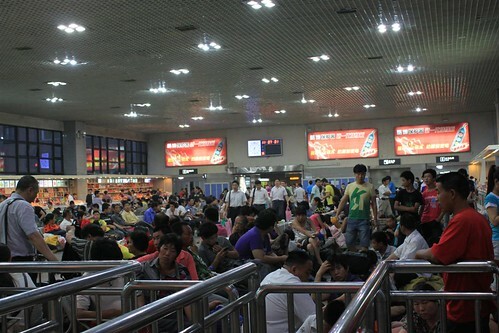 These passengers came very early (more than 2 hours early) and waited outside the departure area. 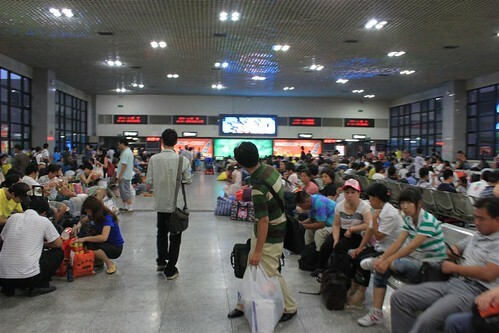 This is a VIP departure waiting area in Xi'an Railway Station. Only those who bought tickets for the private rooms in the trains, are allowed to wait and relax at this air-conditioned waiting room here. Are you going to Vietnam? You need to hire the Green Visa Vietnam service as your tour guide! If you wish to see the best of Vietnam in a comfortable company, they are the ones you want to hire! I have personally experienced their services and they are amazing!